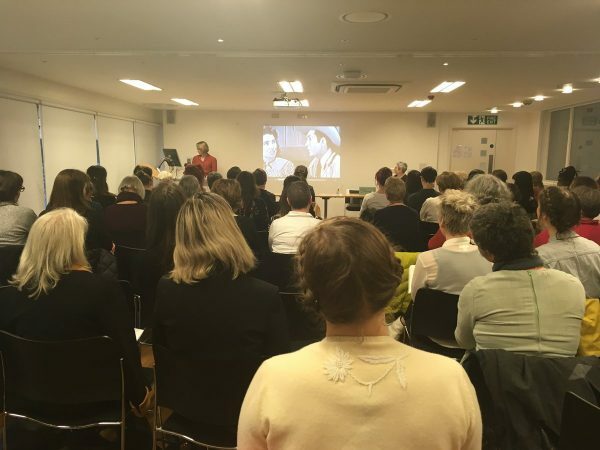 Hannah Rumball, lecturer in Historical and Critical Studies at the University of Brighton, reviews a recent conference that brought together dress historians from across Europe. The academic calendar seems to be bursting with international dress history conferences, and the University of Brighton is a key contributor to the roster. While some of these events can be rather niche in their approach, the Association of Dress Historians’ New Research Conference, held in February 2017, threw open its doors to a satisfyingly eclectic and wide range of topics in the field. From nineteenth century industrial blouse production in Britain and the legacy of Danish couture to the methodologies for studying theatre costume, the study of dress history was presented from all periods and all angles. Held annually, the ADH conference attracts an array of international attendees, with this year proving no exception. Practitioners from the University of Gothenburg, the Design Museum, Denmark and University of Lisbon presented papers alongside delegates from Glasgow School of Art and University College London. The University of Brighton was particularly well represented amongst the speakers, demonstrating the swell of talent within the University’s dress history community. The conference panels were organised thematically, with papers grouped as cohesively as was possible amongst such a diverse offering. Themes included nineteenth century material cultural studies, garments for performance, fashion design monographs, and presentations of new methodological approaches to the study of dress. Enthusiastic Q&A debates meant the conference overran, but the liberal offerings of coffee, pastries and sandwiches fuelled the attendees ready for more. The style of ADH New Research conferences – eclectic, informal and encouraging – is a model of congeniality where students and early career researchers feel emboldened to present their experimental and investigative studies. Exemplifying this approach was Olga Dritsopoulou’s investigation of the conceptual design parallels between the work of supposedly divergent fashion designers. Adapted from her BA (Hons) Textiles with Business Studies dissertation at the University of Brighton, entitled Conceptual Parallels in Fashion Design Practices: A Comparison of Martin Margiela and John Galliano, her convincing argument presented the two designers as analogous in conceptual approach despite their divergent sartorial creations. Through this, she showed how Galliano was the appropriate choice to succeed Margiela when the latter departed from his label. Dritsopoulou used the work of Jacques Derrida to build a complex theoretical framework; through this, examples of each designer’s outputs were shown to exemplify their fulfilment of the same creative goals. Historical women’s sartorial decisions were at the heart of my own paper, presented in Panel One, entitled “British Quaker Women’s Relinquishment of Plain Dress, 1860–1914” and based on my PhD of the same title. My paper presented, for the first time, the three distinct stances which Quaker women took in their choice of clothing in a bid to reconcile fashionability with religious sentiment. Examples of the sourced garments from which the theory developed punctuating the presentation. For the purpose of the paper, emphasis was placed on a case study of two women. The challenge of interpreting their dress choices 150 years later was discussed, alongside contemporary research hurdles. Helena Britt’s paper, “Celebrating 70 Years: The Glasgow School of Art Fashion Show, 1947–2017” was a conference highlight. Britt managed to capture the essence of the seventy year history of the often raucous annual fundraiser. Drawing from a rich, and as yet understudied, archive of photographs and publicity materials from the events, Britt illustrated the show’s evolution. It begun as an amateur affair of collaborative work between students across all disciplines at the art school, with the recreation of historic dress being a key theme of the fashion shows between 1948 and 1949. Today however, the event has become a slickly produced catwalk occasion showcasing the hottest Glasgow fashion and textile talent. Emphasis was placed on how the show plays a crucial part in the portfolio of the students work. Another highlight was Lorraine Portelli’s in-progress investigations of the Maltese wedding dress during the mid-twentieth century. Inspired by the stories of an elderly relative, Portelli’s paper “The Evolution of the Maltese Wedding Dress: Methodological Considerations for a Study” discussed her approaches to investigating the subject. Oral testimony research was central. For Portelli, the elder generation’s memories are central to the narrative as surviving garments are scant in the poor and working-class communities she is studying. However, her paper also provided fascinating flashes of insight into these communities’ traditions, by describing how the design of the wedding dress – which was always black – was largely controlled by the whims and fancies of the local seamstress. Images of rhinestone cowboys and mid-century country music videos completed the conference with hilarity and dazzle, in the form of Janet Aspley’s paper, “All American: Design Sources for Embellished Male Performance Dress in Country Music, 1947 to the Present”. Having turned a lifelong passion into an academic pursuit, Aspley’s PhD research at the University of Brighton has evolved from oral testimony accounts of dress and its role in performance, to evaluating the historical and genealogical meanings behind individual featured motifs. Aspley’s current research into the handwork and traditional embellishment skills evident in the singers’ ensembles, through detailed analysis of the craftsman’s practice, illustrated the heritage and artistry in a style of dress often singled out for ridicule.